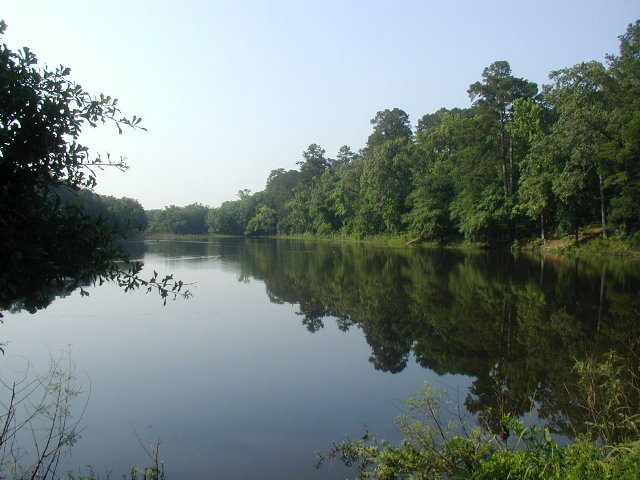 This RV trip took us from Richmond into the area north of Houston that is referred to as the Piney Woods. The large forests of tall pine trees are quite a contrast to the cleared farmland southwest of Houston where we live. I would estimate that some of the trees are over 100 feet tall. They make a big mess when they fall, which we did not observe directly, but we saw the effects at many places. These woods provide a quick escape from the crazy big city life. 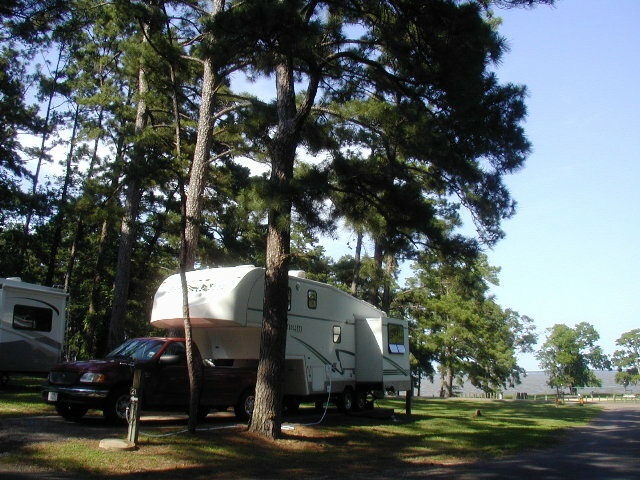 We camped in National Forest Service campsites, a Trinity River Authority campground and a Texas State Park. It sure beats camping at commercial sites. The NFS campsites sometimes have rustic facilities, but they always put you in close contact with nature. The TRA & TSP campgrounds are more developed, but still very good. We didn't get very far from home and were cut short by Kay's mother being admitted to the hospital for pneumonia, but we had a good time for the short week. We hope you enjoy our story and photos. 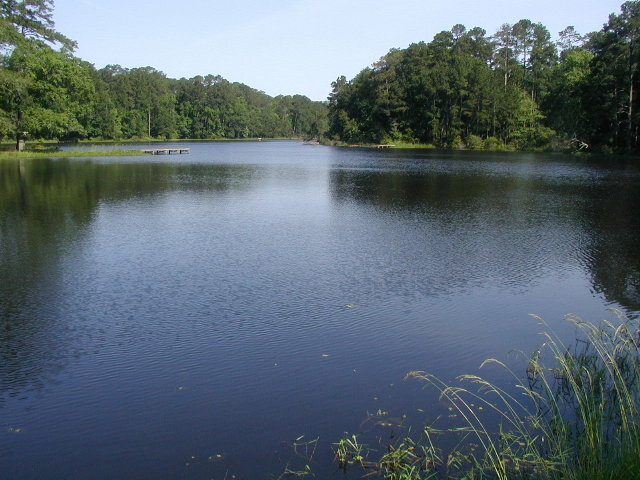 We left home about 10 AM on Monday, May 14th and arrived at Stubblefield Lake Campground (National Forest Service) in early-afternoon, after stopping on the way to eat lunch and grocery shop at Brookshires in Montgomery, TX. As is our usual habit, we took the back roads from home to Stubblefield. We traveled up TX-99 to IH-10, then east to Barker-Cypress. Then north to US-290, then continue north on Telge Rd to TX-2920, TX-149, TX-249, TX-1375 and Stubblefield Lake Rd. to the campground. It sounds complicated, but look at a good Texas map and it is the most direct route and is very scenic - not anything like the freeway desert. We experienced a little surprise when we arrived at Stubblefield Lake Campground and found that it was a pretty primitive campground - no water, electricity, sewer at the campsites. They do have community water, so after a little discussion, we decided that it was a nice place and that we could "dry camp" for one night. The campsites are small, so there was barely room for our rig in one of the sites - this is not a large-trailer park. After getting set up, we sat outside and relaxed and read until it began to thunder and rain. We moved inside and a heavy downpour followed. We spent the rest of the day inside. The temperature that day was 85/65 deg. 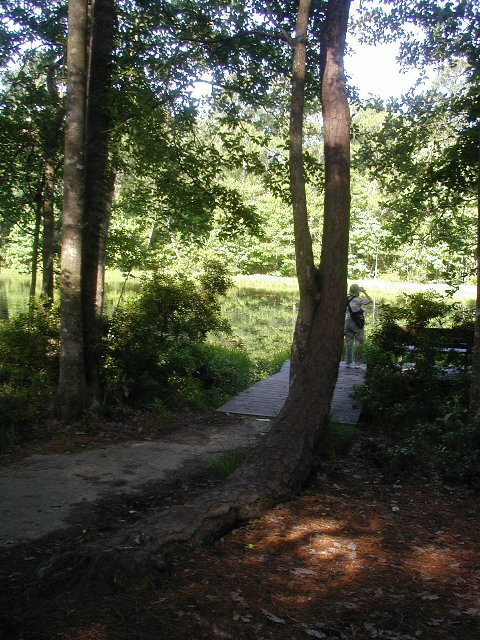 < Our campsite at Stubblefield Lake Campground. After breakfast Tuesday morning, we explored around the campground. 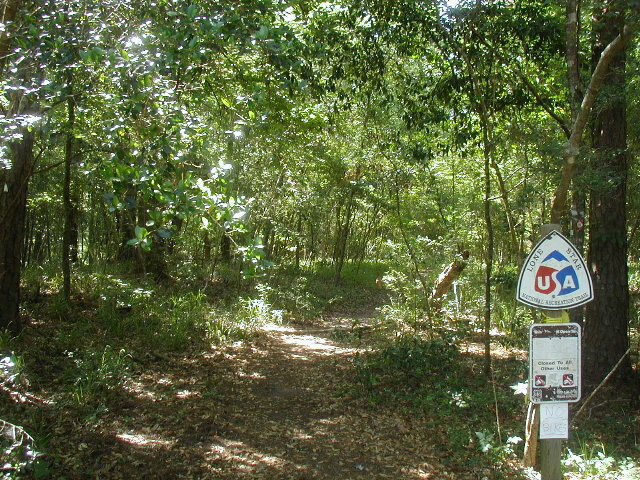 The Lone Star Hiking Trail (LSHT) passes through the campground. We decided to walk down it a short way to see what condition the trail was in this time of the year. We went past the lake and ended up getting on the wrong trail that just lead down into the woods. However, we saw a mother ferrel hog and her family of piglets where we decided to turn around. They ran off before photo time. After backtracking, we found the correct trail and walked north on it for a short distance. It was OK, but one would need to be well prepared to hike it. < Stubblefield Lake < Kay on the LSHT. Before lunch we left Stubblefield Lake Campground and drove about 10 miles to Cagle Campground, another National Forest Service campground. Cagle is on the shores of Lake Conroe and was remodeled about 4 years ago. 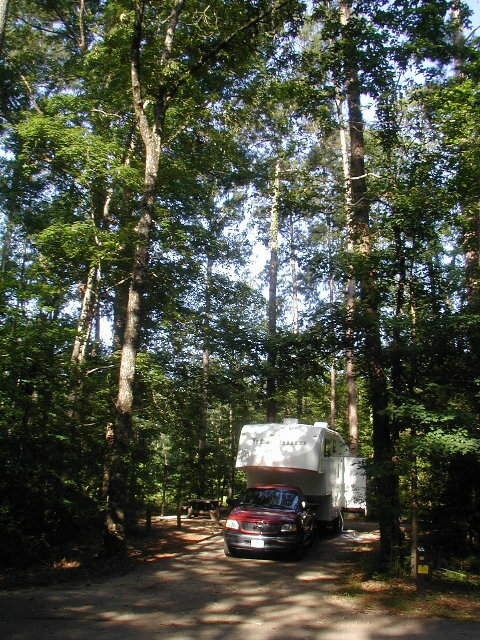 The campgrounds are very modern, with full hookups and beautiful tall trees and lake scenery. After lunch, it was too warm outside, so we stayed inside under the a/c and read again. After supper, we hiked along Lake Conroe and the hiking loop trail south of the boat launch. We saw and endangered Red Cocked Woodpecker and a Summer Tanager. The weather was nice (85/65). 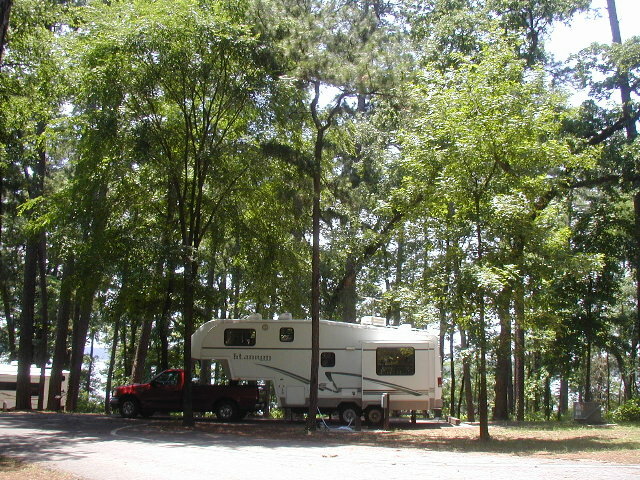 < Our campsite at Cagle Campground. 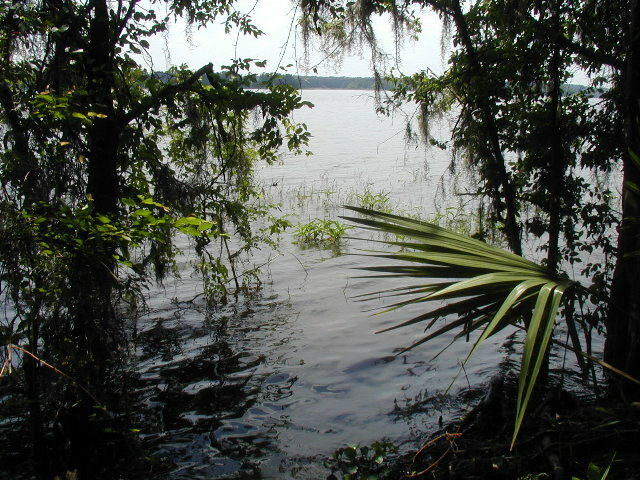 < Lake Conroe behind our campsite. Wednesday morning, we hiked the loop trail south of the boat launch again. 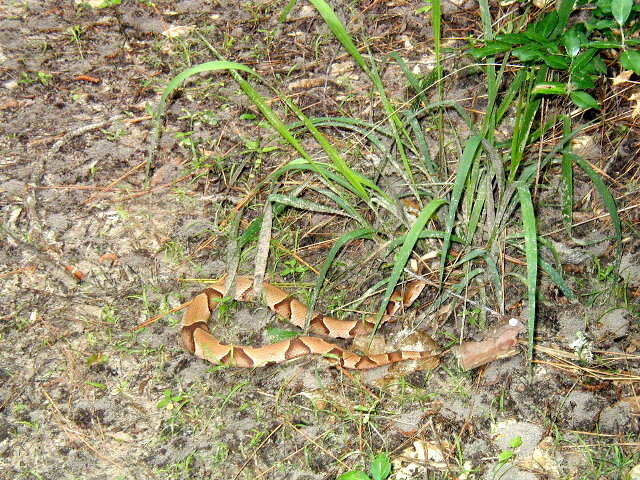 Walking along the trail we almost stepped on a copperhead. We were about 2 feet away when we saw it. I think he just wanted to get his picture taken. < Don't play with these! After lunch, we decided to move on to yet another NFS park a little further east on TX-1375, TX-150 & TX-2025 near Lake Livingston. Named Double Lake, it is really a GREAT campground! The sites have water/electric and some have sewer. 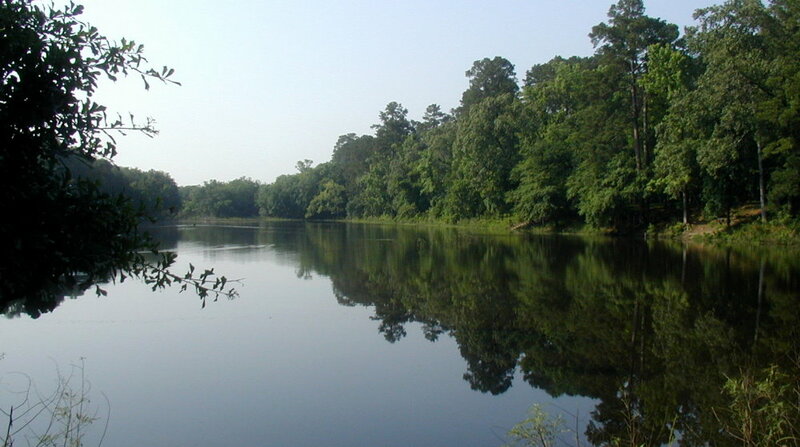 Double Lake is beautiful and the campsites are surrounded by large trees and dense underbrush to give good privacy. Our campsite had a path leading down to an observation deck and bench overlooking the lake. After supper, we went down and sat on the bench at the lake until after sundown and watched the many birds. After sundown the bats arrived, gliding over the lake catching bugs. The weather today was great (75/59). < Our campsite at Double Lake Campground. 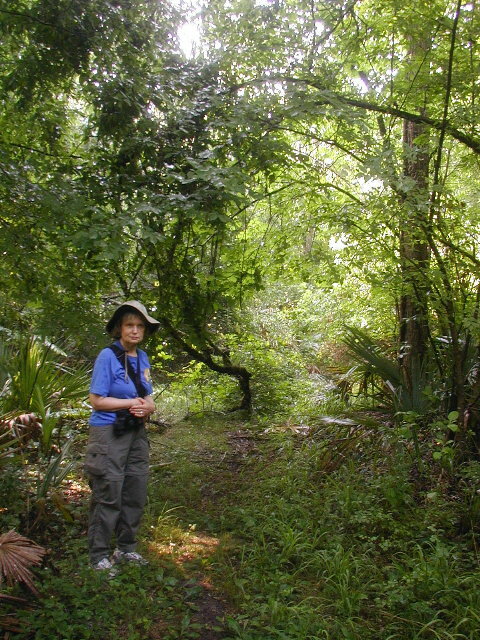 < Kay looking for birds at the observation deck. After breakfast Thursday morning, we hiked the trail around the lake. The trail is very good. Along the way, we came to another spot where the LSHT comes through this campground. We walked about 1/4 mile on the LSHT. It is a good trail in this area. < A view of Double Lake. < The Lone Star Hiking Trail from Double Lake. In the afternoon, we went via TX-2025, TX-150, TX-156 & TX-224 a short distance to Wolf Creek Park on the south shore of Lake Livingston. The park is run by the Trinity River Authority, and has very modern, family-friendly, big-rig friendly and birder-friendly facilities. It is a very popular destination, so it is more crowded than we like. Otherwise it is 100% good. The weather was nice today so we walked around the whole campground before supper. We saw lots of woodpeckers in the tall pine trees. 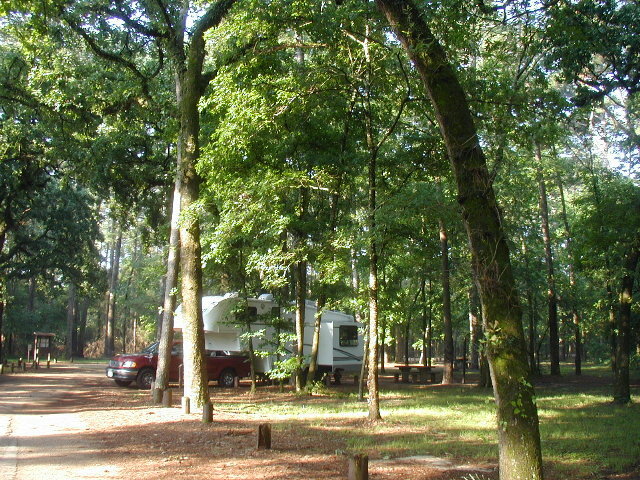 < Our campsite at Wolf Creek Park. Friday morning we drove north, headed toward Rusk, TX, and Rusk State Park. We traveled north via TX-224, TX-156, US-190, TX-356, TX-19, TX-21, US-69 & US-84. Along the way, we drove through Mission Tejas State Park, planning to stop by it on our way back home. We arrived at Rusk S.P. by mid-afternoon. We made reservations to ride the Texas State Railroad next day. Trouble developed back in Houston that night and we almost went back home, but decided to reschedule our train ride to Sunday so we could react to the situation. Saturday morning things had improved back in Houston and we make plans to continue our trip. We saw many beautiful eastern bluebirds and summer tanager right outside our trailer windows. We watched the train leave the Rusk Station in the morning and return in mid-afternoon. We walked the trail that went around the lake. 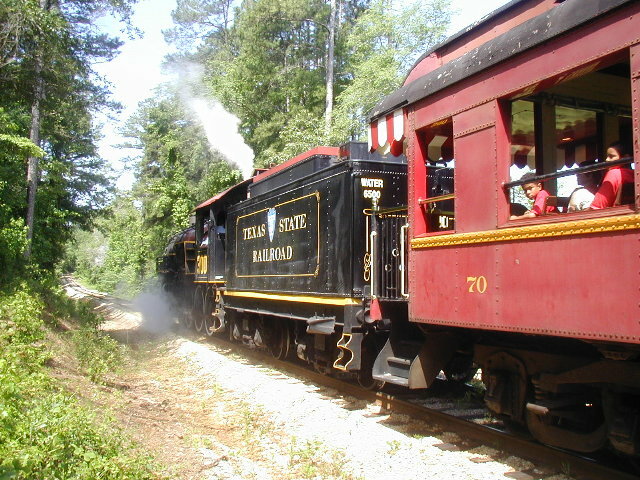 < Texas State Railroad leaving Rusk Station. 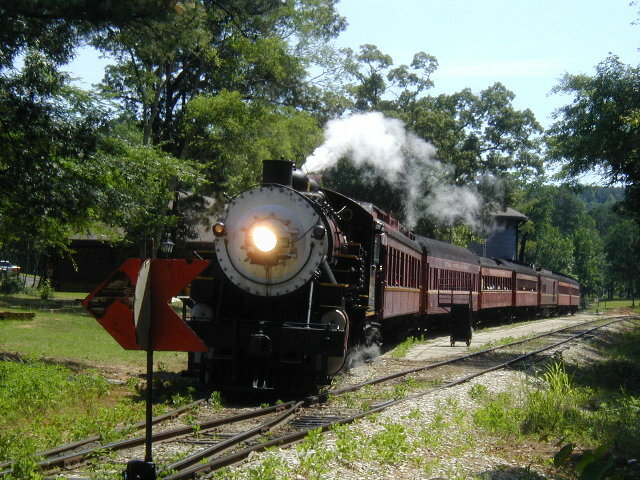 < Texas State Railroad leaving Rusk Station. 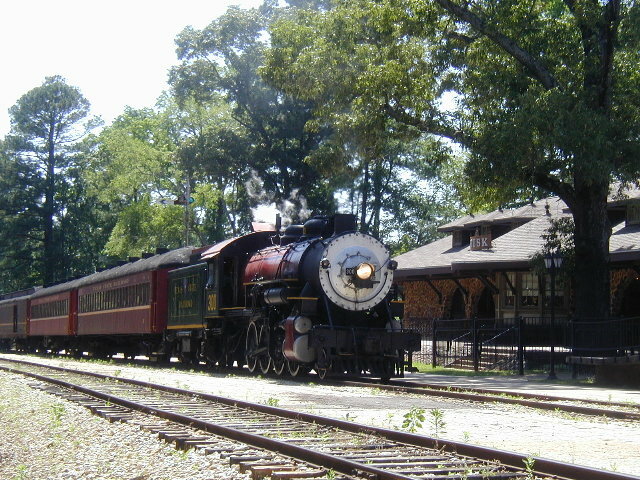 < Texas State Railroad arriving Rusk Station. Saturday night things turned bad in Houston, with Kay's mother going to the hospital. By 11:30 PM we are on our way back to Houston via US-84, US-79 & IH-45, arriving at West Houston Medical Center around 4 AM Sunday morning. Thankfully her mother's pneumonia was treated successfully and she was released the following Thursday. This draws to a close our brief visit to the Piney Woods of Texas. We hope you enjoyed the photos and brief descriptions of our activities. God willing, join us again soon for another RV adventure.